One year ago today, Josh and I checked in at the hospital, ready to meet our little boy. So anxious, so excited, and in my case, a little scared! We were going to be parents?!? Me?? Josh?? Forever known as ‘Mom’ and ‘Dad’ to OUR kid? Responsible for someone else until they’re at least 18 years old!? We knew the day would change our lives forever, but little did we know how much more awesome it’d be. In the past year, B has taught us so much about ourselves and each other. He’s taught me the value of sleep (I took this for granted before! ), the need for patience (this is a daily struggle), the importance of laughter (I need to lighten up more! ), and that you can have fun with just about anything if you put your mind to it (homeboy loves plastic Tupperware containers, plastic bottles, and anything he can hit on the floor to make noise). I never really pictured myself as a mother growing up, but deciding to expand our family was the best decision we’ve ever made. I cannot imagine life now without B. His smiles, laughs, and facial expressions can get us through some of the toughest days. 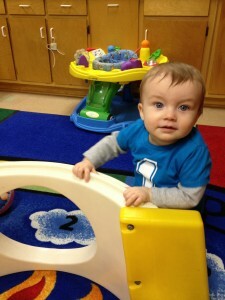 I find that I’m always looking forward to the minute I can leave work to go pick him up and see that sweet face again. I’m amazed at how quickly this year has gone by, and I have so many mixed emotions today. He’s growing up so fast and learning so quickly, and he’s not a little baby anymore (not that he was ever really little!). I love our little man more than I could put into words. I’m not ready for him to grow up, but I know there’s much more to look forward to as he gets older – and for that I’m excited. Happy birthday, little man. Your Mama and Daddy love you very much!